The long-awaited debut flight of NASA’s Orion spacecraft has been scheduled for a morning launch on December 4, a major milestone after nearly 10 years of development. With a window of around 60 minutes, her ride uphill on the United Launch Alliance (ULA) Delta IV-Heavy rocket is targeting a T-0 of 08:03 Eastern Time, from Cape Canaveral’s Space Launch Complex -37B (SLC-37B). The debut launch of NASA’s new BEO (Beyond Earth Orbit) spacecraft is a key step toward the Agency’s still-undefined exploration aspirations. Currently, only two actual missions have been manifested for Orion’s partnership with the Space Launch System (SLS), the latter of which will carry a crew of two astronauts to a captured asteroid on the Exploration Mission -2 (EM-2) flight. 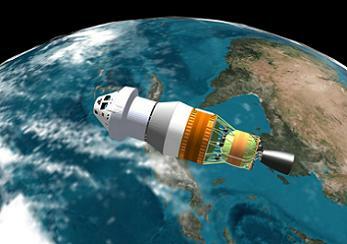 Orion has been a mainstay of NASA’s goal to return to deep space missions for humanity, despite an ever-changing plan. As such, it is unsurprising that the capsule has endured a troublesome infancy. 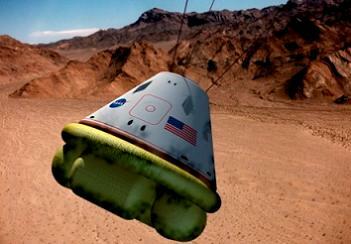 Born out of the Constellation Program (CxP), Orion started life as the Crew Exploration Vehicle (CEV). As with any new program, design changes were hardly unexpected. However, this proved to be a huge challenge for Orion, especially when trying to work with the launch vehicle to which she was married, the Ares I. While some experts argue it was Orion’s large mass that became the main problem, documentation sides with Ares I’s shortfall in performance as the major driver for a series of dramatic design changes, as engineers battled to find mass reserves. A huge design change was soon implemented very early into the development of the capsule, specifically a reduction in the spacecraft’s diameter by 0.5 meters. 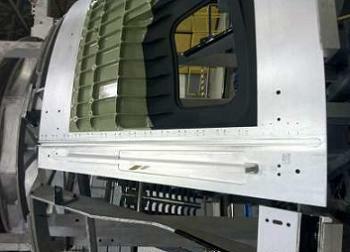 This was soon followed by her Service Module being stripped by up to 50 percent of its original mass. Ironically, that Service Module design was to be later removed from the reckoning, as NASA worked a deal with the European Space Agency (ESA) for the use of ATV hardware on the opening flights – likely to be extended to all flights. Under the control of Lockheed Martin – now with the name “Orion” – the vehicle’s design changes were as frequent as the schedule delays to her debut flight. Most of the changes related to a reduction in capability, with Orion changing from a vehicle that could return to land – via the use of an air bag system – to exclusively landing on water, as is the case today. 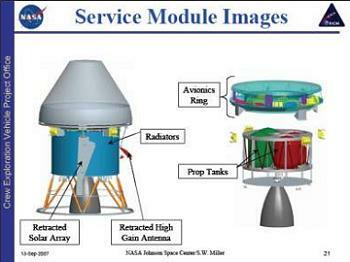 With frustrations growing between Ares and Orion, project managers held a summit meeting in 2007 and decided they would strip Orion down to a “minimum requirement” spacecraft, thus allowing Ares I some breathing space to work within several thousand pounds of mass reserves. Known as the Zero Base Vehicle (ZBV) effort, Orion underwent a mass scrubbing process to reduce her to a minimum weight, ahead of the reapplication of some of the deleted capability, element by element. Notes from “All Hands” meetings around this time didn’t hide the strain between the associated programs, with calls for increased teamwork, chemistry – and to “leave egos at the door” – as a System Definition Review (SDR) board classed Orion’s weight to Ares I’s performance as a “Red” (major) program risk. 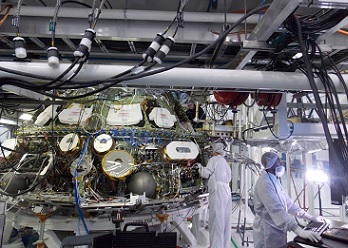 In 2008, the Orion Vehicle Engineering Integration Working Group (OVEIWG) began to reinstall some of the “critical capability” back on to the vehicle, with a brief not to breach the strict mass requirements. The resulting vehicle was anything but the “Apollo on Steroids” that had been promised by NASA’s leadership. Around this time, a new Design Analysis Cycle (DAC) had been called for – in tandem with efforts to resolve Thrust Oscillation (TO) issues – resulting in a major slip to the vehicle’s Preliminary Design Review (PDR) to 2009. With the additional stresses of reduced budget funding for what was then well known to be a struggling CxP, the Office of Science and Technology Policy (OSTP) called for the Review of United States Human Space Flight Plans Committee to take place in 2009. Better known as the Augustine Commission, the review highlighted CxP’s critical issues, ultimately resulting in its cancellation by the Obama administration via the FY2011 Budget Proposal. Orion was saved from the cull – albeit in stages, including a near-pointless role as a very expensive lifeboat for the ISS – before the 2010 Authorization Act refocused Orion on Beyond Earth Orbit (BEO) missions. The first physical sign of Orion’s new life was seen at the Michoud Assembly Facility (MAF), as the Exploration Flight Test -1 (EFT-1) vehicle saw its first panels welded together. With NASA representing the start of construction as “the first new NASA spacecraft built to take humans to orbit since space shuttle Endeavour left the factory in 1991,” the EFT-1 Orion enjoyed a successful build in New Orleans, prior to heading to the Kennedy Space Center (KSC) for outfitting. The launch date for EFT-1 has slipped a few times, moving from its 2013 launch date, to September, 2014. More recently it moved to December 4, to allow for the prioritization of a military satellite launch for the Geosynchronous Space Situational Awareness (GEO SSA) system. Notably, EFT-1 had been on schedule to achieve the original September date, with the numerous integration schedules showing very little sign of issues or delays – a far cry from Orion’s early childhood under the Constellation Program. Work has come together both on land and at sea, with milestones such as Orion’s first power up procedures, through to the recent completion of recovery operations. Now the EFT-1 date has appeared as officially manifested on L2 scheduling documentation, along with a T-0 noted for 08:03 within a launch window that is expected to last for around 60 minutes. The mission – involving two orbits to a high-apogee, with a high-energy re-entry through Earth’s atmosphere on what is a multi-hour test – will provide critical re-entry flight performance data and demonstrate early integration capabilities of the spacecraft. 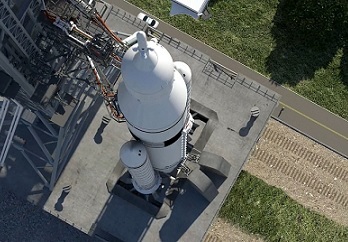 The data from the test will be fed into next year’s Critical Design Review (CDR), where any changes will hopefully be minor and be the final set of refinements ahead of her debut flight on the Space Launch System (SLS). While the first SLS/Orion mission, known as EM-1, is still officially manifested for December 15, 2017 – internally that date has all-but been ruled out. Internal schedules shows EM-1 launch date as September 30, 2018, followed by the Ascent Abort (AA-2) test – required for crew launches – on December 15, 2019, followed by EM-2 on December 31, 2020.